Three years ago, Rabbi Audrey Pollack of SolelCongregation in Mississauga, Ont., decided to follow the lead of Rabbi DebraDressler of Temple Israel in London, Ont., and create an interfaith peace campin Mississauga. 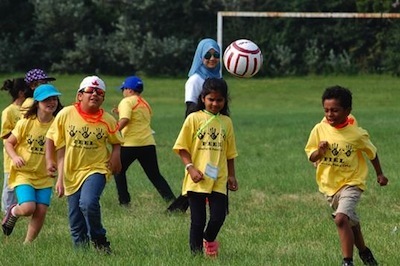 As the chair of the Interfaith Council of Peel, Pollack was well-positioned to start the interfaith camp, and Solel does a lot of outreach in the Mississauga community in general. Pollack wanted to find an Islamic partner who did a lot of English-language programs, as opposed to Arabic. They found Sheikh Jaffer H. Jaffer from the Masumeen Islamic Centre in Brampton, who was excited to join, said Pollack. At first, the interfaith camp’s content was a bit of mishmash, said Pollack, but it is continually being developed and updated to meet the needs of the community. One of the bigger challenges has been to maintain a balance from each denomination; the mosque membership is much larger than that of the church and synagogue. “The first day, we always try to do something that everyone can do together, like a get-to-know-you day,” said Pollack. “Kids need to get to know each other as kids. We do a training beforehand for our adult and teen volunteers, and, I should mention that each faith centre makes a commitment to bring a certain number of volunteers. Each day of camp, they go to visit a different faith centre. The campers learn a little bit more about what each group believes and how they practise their beliefs. Everyone has an opportunity to visit, have a tour and ask questions. “We really expect the youth from each of the faith centres to do some of that explanation,” said Pollack. “It’s an opportunity for them as well. Most of the participating kids go to public schools around the city and may sit next to each other in class, but they rarely get to share anything about their faith in class. They may have some misconceptions or stereotypes about what someone else’s faith or culture is, said Pollack, because they don’t really discuss it. The camp is a great opportunity to share some truth and dispel such misconceptions, she said. The kids who have had this camp experience are already looking forward to next summer, asking when registration will be open, said the rabbi. Their parents, too, are interested in what is going on. “On the last night of camp – we’ve been running this as a four-day camp, maybe five next summer – we get together at one of the centres for a potluck meal,” said Pollack. “It is all-vegetarian, so everybody can eat. There’s a presentation and a slideshow. After the first dinner, all the parents said they wanted to go to camp and learn, so we started doing an adult session, too. “We did a progressive dinner,” she said. “We started with appetizers at one centre, and then moved on to the next centre and had dinner. By the time they got here, at the synagogue, I could barely talk, because they were all chatting away with each other. And, it was great, because many of them, before this, didn’t know each other well. With budget and space limitations, the camp is capped at 12 kids from each faith centre. While the campers pay to attend, the camp makes sure cost is not a prohibitive factor. “We want anyone who wants to, to be able to come, so we try to keep our costs low,” said Pollack. Because the Jewish community in Mississauga is small, said Pollack, “for our kids, when they come together at synagogue, it’s really important for them to connect with Jewish kids. For them, the opportunity to talk to their new friends from different religions and cultural backgrounds, with pride and support of each other, is important. It’s also really important for them to see that there are ideas and values and ethics that we hold in common. Often, we talk about what divides us. “For younger kids, they just like hanging out with their new friends. They’ll talk about the activities they did together, while, for the older kids, they’ll articulate and express what they’ve learned or didn’t know before. Each time they go back, they gain something a little different. “A very valuable part about this camp experience,” she continued, “is building relationships through intentional dialogue and intentional conversation, and the opportunity to do that in a camp setting means that people are doing it in different modalities. They are connecting with each other through play and through giving back to the community.